Here is another game by Zilahi,G from Group D action. There seems to be no direct threats. Can the …Nxg3 idea be for real or is it a bluff? What should white do now? Czibulka,Zoltan and Bodrogi,Laszlo shared first place with 6.5/9. I was equal third with a modest 5/9 after suffering a quick last round loss. Results of the other groups were as follows. Polyanszky-Tamasi, Zoltan and promising junior Furedi, Erik shared first place with 5.5/7. Felmery Tamas dominated the field with 8/9. Szucs Zoltan won by 2 pts with 5.5/7. Here’s my Rd9 game from this 10:00 am this morning. The other games will be played at 2:00pm. It’s a rather horrible quick disaster as I end the tournament on a wimper with 5/9. The idea for the 6.Re1 line I chose came from a NIC YB. I chose a quiet queenless game for the least exitement possible but was soon adrift in an equal position. The position looks harmleas enough. But what do you suggest for white? The position has simplified somewhat and now black holds the d-file. What do you propose for white? I made another draw from a sharp and dubious looking position. Bodrogi resumed his winning ways and beat Zilhani and sits in first with 5.5/8. The others were still playng when I left. Czibulka and Bodrogi,L are showing great strength in the late going while I am limping along to the finish. Bodrogi and Czibulka take the lead with 5.5/8 and I am in second with 5/8. Here is my Rd8 game. White has parted with a pawn for an attack and black accidentally dared white to come the the 7th rank. Assess this sharp position. The long diagonal is blocked, h7 and g7 are covered and black is threatening to consolidate with …Rad8. The ..Bxg3+ threat lingers but is very dangerous. I was not worried at this point. I played an uneventful looking quick draw today and now stand at 4.5/7. However, the analysis shows many subtle points that I was blissfully unaware of during the game. The other four games had plenty of life in them. all other games were still in progress when I left. Black chose the fashionable solid …a6 Slav and white showed no real understanding and insufficient preparation and understanding to make any headway. In the even ending that followed there was a moment for white to show some level of competance. Here it is. The b- pawn is under attack. How should white react? Here is another game from Rd5. The winner was the dangerous veteran Zilahi,Gabor who I will face in Rd7. Zilahi is tied for 2nd with me now with 4/6. Here is an example of his aggressive positional style. Black tried for active kingside play but white forced the queens off leaving black with nothing to show for the loosening kingside advances. Black is suffering in the ending. What is the most precise path for white? I made a hard fought draw with the #2 player but did not make the most of my chances. Katona,J-Bodrogi,L 1-0 in a Nge2 Nimzo-Indian(E46); This was a surprising upset as black looked to be outplayed. White repeated the line I used in round 1 and made an improvement on move 9. Zilahi,G-Nagy,L 1-0 White won a nice ending. 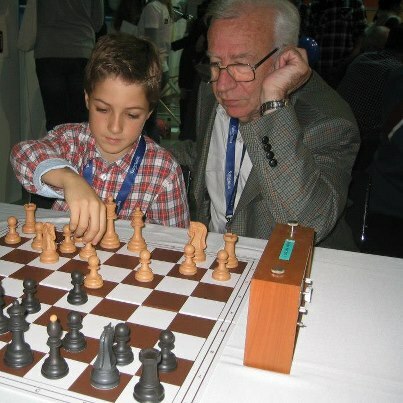 Czibulka,Z-Szili,A draw in Catalan. White saved a lost ending. Now I have 4/6 for =2nd with Zilahi,G. Bodrogi,L remains in first with 4.5/6 despite today’s loss. This was a sharp game with black calling the shots in a kingside attack. The ..f4 attack wedge has been formed. How should black continue the attack? The initial thought I had was …Qe8-h5, ..Ng4,…fg and then …Rxf3 destroying the h2 defender and then …Qh2#. Is the an immediate combination? Is there a favorable forced line? Is there an optimal attacking plan? The position still has some promise or so I initially thought. What is right way to continue? I got my game going and won a nice one today. Czibulka lost Bodrogi,L who seems to be unstoppable. Szili was losing to Szlabey. The position is sharp. How should white continue? There seem to be many options. I lost embarassingly quickly within a few minutes of the start of the round to a simple tactical oversight. Now I am at a modest 2.5/4. Katona had Q+N vs Nagy,L’s Q+B in a good N vs bad B almost ending. Szili,A had R vs the B+N of Molnar in a compex ending. Warning!! It’s painful to go through. An early queenless game has arisen where white has given up the bishop pair to compromise black’s kingside pawns. How do you assess the position. White should black do? This is more a question of understanding than anything else. I was not sharp in this game. Can you do better? Black has fallen asleep. What about you? White is on the move-what should white do? I first felt a bit disgusted but the routine after losing a game must be to take an objective look at the game to see what really happened. The Bxh6 plan took me by surprise but should not have caused any problems. 13…a5 was a bit casual and caused by my superficial knowledge of the 2.g3 queenless game. Now I am more familiar with the specific ideas, and the necessity of black to find and active defence before white can settle in with Be4/Nf5 or Bf5 etc. Play changed from quiet building to concrete considerations without my noticing. This was the real cause of the loss. 16…Be7?? Here the inexplicable needs explaining as this is just not an acceptable blunder. I just did not use any kind of hard thought to figure out what my opponent was up to. This is a breakdown of self-discipline rather than lack of tactical ability. So the real causes of the loss have been dug out and improvements found and documented. The knowledge gap is filled. Now it is time to reapply myself for the remainder of the tournament. This was my rescheduled Rd2 game which I won. Now I have 2.5/3. The game was played at 11am but came after yesterday’s 70-move marathon so I was not feeling so energetic. The queenless game came early for black but now deep into the maneuvering phase black needs to make progress to exploit the better structure. What do you suggest? Something else? Is there a hidden tactic perhaps?